Udta Punjab’s soundtrack has melody, variety and oodles of style! 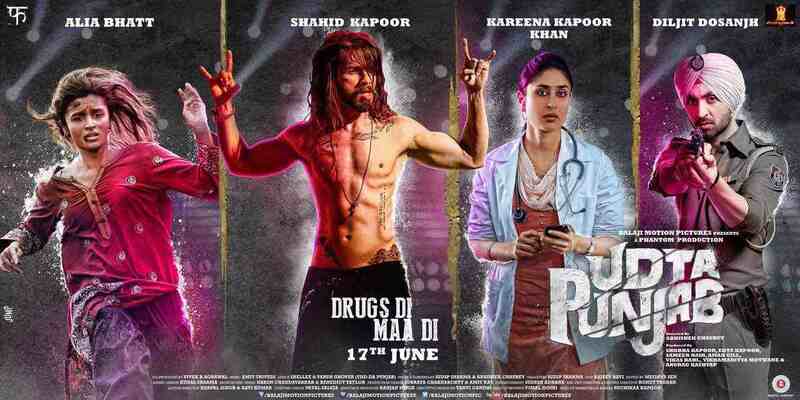 Tusshar Sasi	 June 17, 2016	 Leave a Comment on Udta Punjab’s soundtrack has melody, variety and oodles of style! The signature song of Udta Punjab – Chitta Ve – takes a little time to grow on you. First up, we Indians aren’t used to rap minus irrelevant, misogynistic lyrics. Heavy on techno beats and a decent dose of auto-tuner at use, the song is your ultimate party track – but only once the groove is on. Shellee’s lyrics are gutsy, unusual and roars what the Censor board didn’t want you to listen. Busy is the word for Amit Trivedi’s composition that is all over the place – mixes genres, plays around with tempo and the auto-tuned portions do distract a bit. Yet the track fits the film’s theme like a glove. Indeed an incredible beginning to the soundtrack. What’s up with Bollywood’s reprise versions? We end up loving them more than the originals – unless crooned by Salman Khan. The case isn’t any different here. Diljit Dosanjh’s innocent voice beautifully captures the essence of Shiv Kumar Batalvi‘s timeless poem – Ikk Kudi. And let’s not ignore his flawless, earthy pronunciation! Shahid Mallya is no greenhorn but this song isn’t just his. His vocals are way too raspy with the emotions clearly amiss – probably the minimal orchestra were to be blamed here. Overall, the lyrics and rendition are oh-so-pristine and mushy that the next track gives you a culture shock. Here comes the best of the album – the title track – Ud-Da Punjab. The catchy hook to the groovy rap and splendid instrumentation, the song has everything going for it musically. What takes the cream pie out here? Indeed the ballsy lyrics by the fantastic Varun Grover. The strong words do not overwhelm the melody (yes, it has one). They simply help bring the tune alive. Amit Trivedi and Vishal Dadlani’s vocals contrast and work in favour of the song. For starters, one wouldn’t expect Trivedi to pull this off like a pro and, boy, he does just that. Have you met Kanika Kapoor minus baby dolls, chittiyan, kalaiyaan, farratte and the rest of her props? Something we thought that only a Richa Sharma could pull off, Kanika does it and how – a trippy Punjabi pop number titled Da Da Dasse. Babu Haabi‘s rap portions are so good that your faith in the genre returns after years of enduring Honey Singh and Badshah. Although the peppy folk melody that gets wee bit monotonous towards the end, Da Da Dasse is decent track. Special mention to Shellee’s thoughtful words. The weakest track of the enterprise is Amit Trivedi’s Vadiya. Lyrics aren’t bad while the pedestrian rendition and the elements of psychedelia in the composition jar big-time. The base melody brings in a strong Amit Trivedi deja vu which further kills the impact. Sounding more like a situational track, Vadiya should make sense with the film’s narrative. Shahid Mallya’s Has Nachle is one stand-out qawwali-based track that challenges Ud-Daa Punjab in being the best piece of the soundtrack. The chorus and the harmonium notes lend the song a soothing vintage touch thus rendering great repeat value. So… if you are done with your mandatory trip to the cinema hall, take a shine to Udta Punjab’s supremely versatile OST that has something in store for all sorts of Indian film music lovers. Meanwhile, the music team of Udta Punjab – take a massive bow. Previous PostTe3n – Strange concoction of good drama and bland suspense! Next PostDhanak – Two endearing children, an eventful journey and plenty of smiles!